Paddock stock a wide range of books suitable for Freelander. Inc. VAT: £14.95 Inc. VAT: Info UK VAT charged at 20%. Ex VAT £14.95 Ex VAT Info Outside of EU and EU VAT registered companies only (not UK). 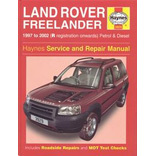 Haynes Service and Repair Manual 1997 to 2002 - all models except V6 Petrol. Inc. VAT: £15.95 Inc. VAT: Info UK VAT charged at 20%. Ex VAT £15.95 Ex VAT Info Outside of EU and EU VAT registered companies only (not UK). Official Workshop Manual by Brooklands. Covers 1998-2000 model year. Inc. VAT: £55.95 Inc. VAT: Info UK VAT charged at 20%. Ex VAT £55.95 Ex VAT Info Outside of EU and EU VAT registered companies only (not UK).